Spreckels Theater still standing on Broadway. Dr. Sandra Bonura 3:15 March 29, 2019 "1887 & Beyond: John D. Spreckels: Builder of San Diego." For the Middle Era (1851-1950), we'll see how dangerous sea travel was before the building of our first Point Loma lighthouse. Travelers discovered Southern California in droves, thanks in part to Helen Hunt Jackson turning her deeply-detailed but rarely-read research on the treatment of the Native Americans into the romantic myth of "Ramona." By the booming 1880s, streetcar service evolved into more than transportation: it seeded neighborhoods and allowed for a growing population to live further away from a city center. John D. Spreckels was one of those amazing men who, had he not made San Diego his home, we never would be the same. And when we talk about "southern" California, it's important to remember how much bigger San Diego County used to be. Please come out to WARWICKS in La Jolla on JANUARY 28 to purchase my book at my price. HAWAI'I PUBLIC RADIO - On my way in! CHICAGO and OHIO....Retracing Ida Pope's life outside Hawaii. SO EXCITED! Thank you Office of Hawaiian Affairs (OHA) for hosting this 2014 event. MAHALO! The Hawaiian Historical Society members and friends heard the story of a remarkable woman who lived for more than a century and knew Queen Lili'uokalani "as the only mother I had." 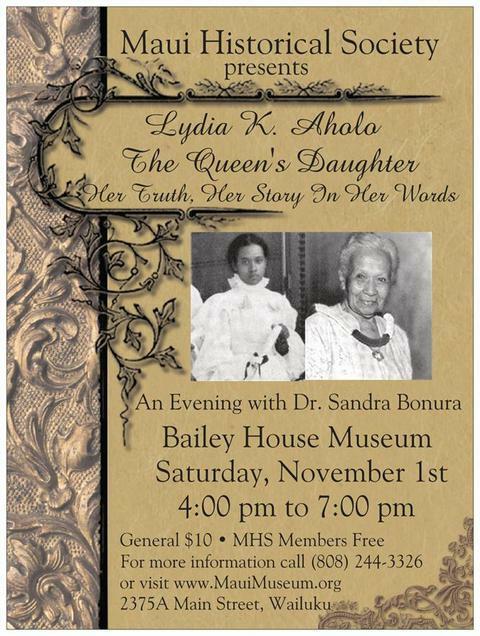 The woman—Lydia K. Aholo—was the subject of an illustrated talk presented by Sandra Bonura at the Society's membership meeting on Thursday, February 13, 2014 at the Kana'ina Building (Old Archives Building) to a standing-room-only crowd. Lydia Aholo was born February 26, 1878, in Lahaina, Maui, to Luther Aholo, minister of interior during the reign of Kalākaua. He had earlier represented Lahaina in the legislature and served as postmaster general. Her mother, Keahi, died shortly after Lydia's birth, and she became the hānai daughter of Queen Lili'uokalani. She was reared in the royal household, attending Kawaiaha'o Female Seminary, Kamehameha School for Girls, and Oberlin College, where she studied music. She discussed her life with the queen and at school in oral history interviews with Helena Allen in 1969. She died at the age of 101 on July 7, 1979. Sandra Bonura is the co-author of An American Girl in the Hawaiian Islands: Letters of Carrie Prudence Winter 1890-1893. This book includes love letters by a Kawaiaha'o Female Seminary teacher to her fiancé that were found in a forgotten attic trunk. During her research for the book, Bonura located the taped interviews by Lydia Aholo and facilitated their return to Hawai'i, where they are now held at Kamehameha Schools Archives. SPRECKELS FAMILY MEETS EACH OTHER FOR THE FIRST TIME. Sandra Bonura hosted the reunion and the Union - Tribune covered the two day event. PLEASE WATCH THE SPRECKELS FAMILY REUNION AT THIS LINK. WHAT WONDERFUL PEOPLE! Jan 21, 2018 MYSTERIOUS GALAXY - LOCAL AUTHOR EVENT is at 12:00 - I will have books on hand!